Wm Paul Dean Raney, Sr. Celebrating the life of Wm Paul Dean Raney, Sr.
Be the first to share your favorite memory, photo or story of Wm Paul. This memorial page is dedicated for family, friends and future generations to celebrate the life of their loved one. 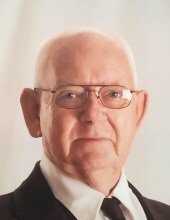 Obituary for Wm Paul Dean Raney, Sr.
Wm Paul Dean Raney Sr. 83 of Willis, TX went to his Heavenly home on Saturday, February 2, 2019 at 4:24 in the morning. Born July 22.1935 on the border of Missouri and Arkansas in Geneva, he always said he was born in Arkansas, his mother was across the line in Missouri. He was a long time Deacon of the Southern Baptist Church and a devoted teacher of the Holy Bible. A kind, gracious man, who never met a stranger. An Army Veteran, he was trained by the Veteran’s Administration as a Small Engine Repairman, but truly he was a Jack of all trades from truck driver to Santa Claus. He truly had the red hair of the Irish and the soul of a Cherokee. Survivors include his wife of 58 years, Linda Shirk Raney, His daughter Martha Raney, His son William Raney and his wife Carrey and their two sons Christopher and Frederick Raney, his son Royce Raney and wife Jenelle Raney and their sons Jonah Allred, James Raney and Royce Alan Raney Jr. and one grand-daughter Mallory Davis. He had four great grandchildren, James’s three daughters, Karlie, and twins Aubrey and Ava, and Jonah’s son Monte Cash. He also is survived by one brother Howard Wendel Raney and one sister Shirley Heidars along with many nieces, nephews, friends and church family. He was preceded in death by his parents, Sherman and Myrtle Raney, one brother Dallas Raney, two sisters Wilma Skeen and Willa Mae Lassister and one grandson Matthew Raney. A Memorial is planned for Sunday, March 17, 2019 at The Fellowship Church at 12314 Rose Rd in Willis, Tx at 3:00 pm with potluck refreshment to follow service at the Church. Attire is something green and a feather to honor Paul’s Heritage. To send flowers or a remembrance gift to the family of Wm Paul Dean Raney, Sr., please visit our Tribute Store. "Email Address" would like to share the life celebration of Wm Paul Dean Raney, Sr.. Click on the "link" to go to share a favorite memory or leave a condolence message for the family.